It was probably the weirdest moment of my professional life to date: telling students in my "Career Planning for Humanities Majors" class that we probably wouldn't be meeting next week because I would be on strike. They looked at me, nonplussed. "NO WAY!" one blurted out. Yes...way. I scribbled my non-university email address on the board and said I'd be happy to email or talk with them about the reasons for the strike outside class, and I pointed them to a website and a stack of fliers they could consult for additional information. Then we got on with the business of the day: another lesson in finding a professional post-graduation job. My students see me, week after week, in all my dark-skirt/drapey-cardigan/colorful-scarf matronly professorial glory, dispensing hard-won professional wisdom, advice, and grades. I am a lesser angel in their personal pantheon of authority that stretches all the way up to God and Mom. "Strikes" are something they associate with workboots and insulated hoodies, building workers and trades. Their bewilderment meshes with the cognitive dissonance many of us feel, finding ourselves preparing to strike. My graduate assistant gamely offered to take over next week's class. Her graduate student union has a contract with a no-strike clause, so she has to put in her requisite hours working for me, whether I'm there to supervise her or not. That would have been fine, except that the class for next week is organized around a guest speaker. Our planned speaker worked for 30 years as a writer for an industrial corporation. For a variety of reasons, personal and professional, she decided to switch tracks. She went to grad school and got the credential that now has her teaching courses and running a first-rate internship program in an adjacent department that draws on her deep knowledge of her writing field. However, she and I, unlike my graduate assistant, have been working for nearly two years now without a contract. She's part of the same bargaining unit. The strike affects her, too, and I cannot in good conscience ask her not to withhold the same labor I'm withholding. 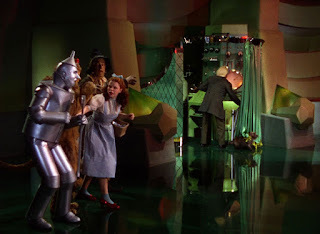 What students don't know is that much of the undergraduate faculty operates like the Wizard of Oz. If you pull aside the curtain on many instructors' and lecturers' labor, the edifice revealed is not the stable timeless wizardry of institutional respect, academic freedom, history and longevity, research support and professional remuneration. These things, which are widely assumed to be funded by tuition dollars to sustain college-level teaching, are not there. It's just a man or woman, with (in many cases) a nine-month contract, no guarantee of employment beyond the semester, a salary suitable for the entry-level jobs our students apply for with their brand-new BAs, a tenuous relationship with their home department, and no research support. Unlike the Wizard, non-tenure-stream faculty still manage to deliver the goods. It's a mighty amplifying system we have, here behind the curtain: love of one's subject, commitment to students, the knowledge that comes with the requisite graduate credential, and a willingness to behave as if the edifice were in place even though it's not. These things go a long way to produce the college experience students seek at our institution. It's not fair to the students, though, who think their rising tuitions are paying for genuine wizards with all the institutional power that comes with the role. It's also not stable, particularly as the support for wizards declines and the university's reliance on jerry-rigged smoke-and-mirrors illusions grows. Is it "unprofessional" to go on strike, as some detractors may claim? At the point where "professional" is only being sustained by willingness of faculty to uphold the illusion, the question becomes meaningless. Wishing you a much better contract and a peaceful strike. It's our first contract! Thank you for the good wishes. Your comments are both an inspiration and a mirror. I am an adjunct motivated just as you say, with a similar profile, but probably lacking your demi-angel status with my students. You make clear that those of us at CUNY, without a contract for 6 years, but inhibited by the illegality of public employees' striking, have waited long enough.